The Satechi 75W Dual Type-C PD Travel Charger has ports for all your gadgets. Unlike Apple’s wall chargers that have just a single USB-C port, the Satechi 75W Dual Type-C PD Travel Charger has a pair of them. It also boasts two USB-A ports. AdvertisementSatechi also just used the Consumer Electronic Show to launch a cheaper 30W Dual-Port Wall Charger. One of the USB-C ports in this company’s new travel charger can provide 60W of power, the second one 18W. These can recharge the latest iPad Pro models or MacBooks. The accessories’s USB-A ports are handy for charging other devices. They can provide up to 12W. Satechi’s latest travel charger comes with the power cable needed to plug it into a wall socket. It isn’t bundled with any USB-C or USB-A cables, though. The Satechi 75W Dual Type-C PD Travel Charger next to the 30W Dual-Port Wall Charger. The single USB-C port in the 30W Dual-Port Wall Charger offers up to 18W of power. Its USB-A 3.0 port can provide up to 12W. Both these chargers support the Power Delivery (PD) standard so they supply only as much current as the devices they are charging can safely handle. 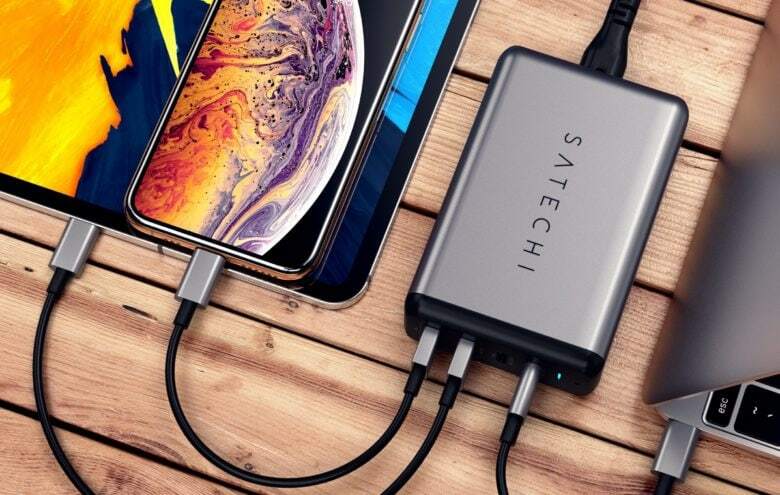 Satechi’s four-port travel charger is available now for $69.99. Its dual-port wall charger will be available on January 31 for $29.99.